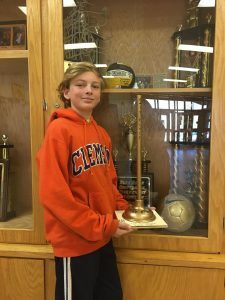 Home / School News / WMS Wins Golden Plunger Award! WMS Wins Golden Plunger Award! Saturday, February 2 at Lake Junaluska the seventh annual Polar Plunge was commenced to raise money for science programs in Haywood County. Waynesville Middle teachers, Mrs. Linda Estes and Mr. Joshua Robinson, followed by one sixth grade student Oliver Williams, plunged into the lake. WMS not only did this, but raised well over their expected set donation amount and won the “Golden Plunger” award. We want to thank all of those who donated and contributed to the cause.